Metabolism refers to all of the energy-requiring chemical reactions occurring inside your body. At any one time, trillions of reactions are going on inside of you, including the growth of new tissue, muscle contraction, and the breakdown of food for energy. Recommendations for exercise during pregnancy have undergone significant modifications since 1985. Initial guidelines placed restrictions on exercise intensity and duration, limiting women to a heart rate of less than 140 beats per minute and restricting exercise to 15 minutes or less. 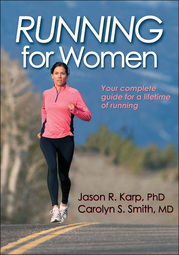 Running for Women provides comprehensive information on training female runners based on their cardiovascular, hormonal, metabolic, muscular, and anatomical characteristics. Women will learn to maximize workouts around the menstrual cycle and to guard against common injuries, disordered eating, osteoporosis, and menstrual irregularities.